Throughout the past year, young people in the Philadelphia Student Union built leadership in the movement for public education. Will you stand with students in Philadelphia in 2018 by making a contribution to the Philadelphia Student Union? All donations will be matched by the Cahn Funds for Social Change and a small circle of donors. Came together to learn, build power, and strategize at weekly chapter meetings and citywide meetings, direct actions and trainings, candidate forums, marches and rallies, national convenings, and more. Built new organizing, media, and arts skills in new weekly programming using arts and culture as a means to tell stories and develop tools for critical analysis. Won the implementation of a district-wide complaint system for students and parents to report abuse and assault by School Police Officers in their schools. Alongside 7 other allied organizations, led the Philly Mama’s Day Bailout, a initiative to celebrate Mother’s Day by crowdfunding to bail as many mothers out of jail as possible. Fought for statewide funding for public schools, joining with allied organizations to demand a fair funding system across Pennsylvania. Co-sponsored a Juvenile Justice Candidate Forum for the Philadelphia District Attorney race at Benjamin Franklin High School, one of our chapter schools. After sixteen years of fighting to abolish the School Reform Commission, succeeded along with our allies in ending the SRC and returning local control of our schools to Philadelphia, while continuing to fight for a People’s School Board. 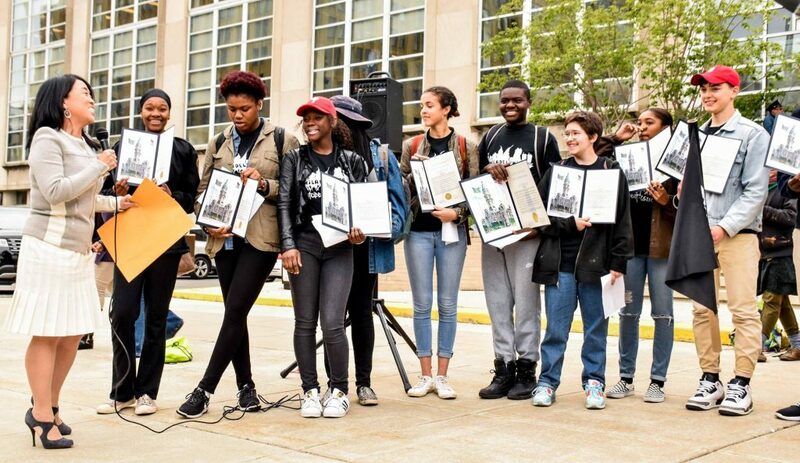 Planned, participated in, and were leaders within national movement spaces focused on alternatives to policing, ending school privatization, and ending policies that have a disproportionate negative impact on young people of color. These spaces included National Mama’s Day Bailout, Movement for Black Lives National Policy Table, Journey 4 Justice Alliance, Ending the #AssaultAt National School Police Strategy Meeting, and Alliance for Educational Justice. With your support, we will continue to build the leadership of young people in Philadelphia for many years to come. In 2018, we will be expanding our organizing citywide and school-by-school, building chapters in new schools, particularly in West Philly, and offering intensive organizing training in every one of our chapter schools. Please join with the Philadelphia Student Union today by becoming a sustainer or making a contribution.